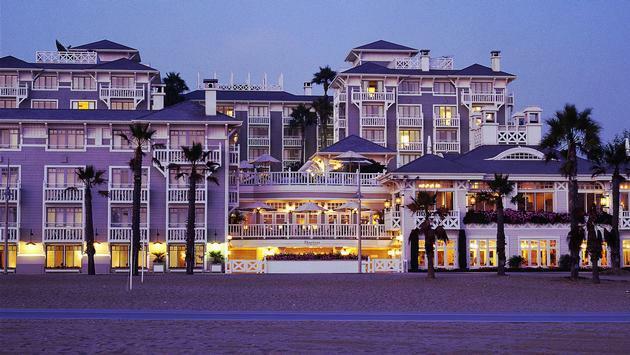 Preferred Hotels & Resorts, a global provider of sales, marketing and distribution services to independent luxury hotels, is proud to announce that two of the most celebrated hotels along the United States’ Pacific Coast–Shutters on the Beach and Hotel Casa del Mar–have joined its brand portfolio as the newest experiences within its esteemed Legend Collection. The addition of these two world-renowned properties enhances the global scope of the Preferred Hotels & Resorts Legend Collection, which represents more than 90 of the world’s finest and most iconic names in independent hospitality. “We are delighted to join Preferred Hotels & Resorts and to align Shutters on the Beach and Hotel Casa del Mar with the brand’s prestigious Legend collection. Through this strategic partnership, our guests and travel partners will benefit from Preferred’s global suite of enhanced offerings including the latest technology and a global network of travel sales experts,” said Klaus Mennekes, vice president and managing director of Edward Thomas Collection, parent company of Shutters on the Beach and Hotel Casa del Mar. Shutters on the Beach is a beach-chic destination that draws in-the-know locals and discerning jetsetters alike for its breezy, inviting, and cozy vibe, anticipatory service, and world-class amenities. All of the hotel’s 198 guestrooms, including 12 suites, feature outdoor balconies, while public spaces are adorned with original works by Modern art greats such as David Hockney, Roy Lichtenstein, and Robert Motherwell. Stellar dining options include 1 Pico, where the menu highlights California fresh cuisine; The Living Room, a see-and-be-seen gathering place serving light bites; and Coast Beach Cafe and Bar, a laid-back, indoor/outdoor, all-day hotspot. Reigning as the favored beachside playground for Hollywood A-listers for more than 90 years for its commitment to providing extraordinary service and privacy, Hotel Casa del Mar is ideally situated at one of the most well-appointed addresses in California on the world-renowned Santa Monica Beach, next door to Shutters on the Beach and adjacent to historic sites such as the Santa Monica Pier and the cliff-top Palisades Park. The hotel features 129 guestrooms, including 16 suites, all with views of the Pacific Ocean coastline; a private, guest-only fifth-floor Palm Terrace Pool; an eco-minded Sea Wellness Spa; and a variety of dining options that highlight Southern California’s seasonal, farmers’ market-driven fare including signature restaurant Catch and the airy lobby-level Terrazza Lounge. All guests of Shutters on the Beach and Hotel Casa del Mar are now eligible to enroll in I Prefer Hotel Rewards, which extends points redeemable for cash-value Reward Certificates, elite status, and special benefits such as complimentary Internet to members upon every stay at more than 650 participating Preferred Hotels & Resorts locations worldwide. Both hotels are also now bookable via PreferredHotels.com and on Preferred Hotels & Resorts’ “PH” and “PV” GDS chain codes. In addition to Shutters on the Beach and Hotel Casa del Mar, new hotels and resorts that have joined the Preferred Hotels & Resorts Legend Collection in the past 12 months include Encore Boston Harbor (Massachusetts, USA); The Sanchaya (Indonesia); The Inn at Perry Cabin (Maryland, USA); Grand Velas Riviera Maya (Mexico); JA Manafuru (Maldives); Grand Velas Riviera Nayarit (Mexico); Grand Velas Los Cabos (Mexico); and The Fullerton Hotel Sydney (Australia). Other destinations represented within the collection include notable names such as Montage Los Cabos (Mexico); The Beaumont (London); The Mark (New York); Post Ranch Inn (Big Sur, California); The Leela Palace New Delhi (India); The Upper House (Hong Kong); Grand Hotel Tremezzo (Lake Como, Italy); Finca Cortesin (Malaga, Spain); The K Club (Kildare, Ireland); The Siam (Bangkok, Thailand); Hotel Unique (São Paulo, Brazil); and Palazzo Versace Dubai. For more information on Preferred Hotels & Resorts, its member hotels, programs, products, and services, visit PreferredHotels.com. SOURCE: Preferred Hotels & Resorts press release.